No marked graves found within this cemetery. From the Hancock County Courthouse, go 2 blocks east on Broad Street to Boland St. Turn right on Boland, which becomes Linton Rd, and go 6.6 miles on Linton Road. Turn left off Linton Road onto Brown Chapel Rd. Go 0.3 mile to the first house (brick) on your right. Turn right, gain permission, and go past the left side of the house for 0.2 mile, following the field road which turns to the left. The cemetery will be to the left of the field road, with the granite walled area about 150 feet into the woods from the field road. 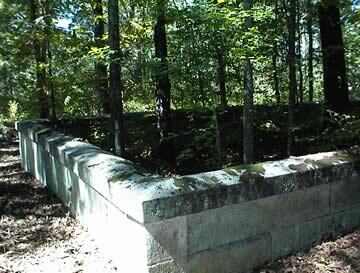 A 40' X 60' walled granite area sits within a much larger rectangular area designated by 3' granite posts at each corner. The larger area is approximately 200' by 250' and possibly has many unmarked graves. A few scattered fieldstones can be seen. The name of this cemetery is from anecdotal accounts and the Kimbrough list, with no clear proof of its name. Anyone knowing anything about this cemetery is asked to contact us. No visible graves. Name per anecdotal accounts. Graves within walled granite block area, and many possible graves outside of walled area.